Travel to the British Virgin Islands is easier than you may think! Horizon Yacht Charters BVI are pleased to offer the following flight suggestions for how to get to the BVI for your yacht charter. The British Virgin Islands (Airport code EIS), also known as “Natures’ Little Secret”, is located approx 90 miles east of Puerto Rico, and there are BVI flights through a variety of routes. The official language is English and the local currency is the US$. As well as the information below, the BVI Tourism Board maintains useful BVI travel information. There are many carriers with flights to these destinations including American Airlines, Continental, Delta, Jet Blue and Spirit Air. From either of these destinations, you have several choices of a carrier for your onward connection to Tortola, BVI as below. Here is a list of the current US flights from USA to BVI (but always check with your carrier since schedules may change). 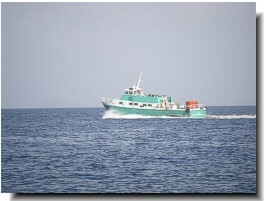 From St Thomas it is a simple ferry ride to Tortola! You will need to take a taxi to the ferry terminal – don’t worry there are numerous taxi operators who will be waiting for your inbound flight to arrive. The closest ferry terminal to the airport is Charlotte Amalie (around 10 minutes by taxi). The other ferry terminal is at the East End of St Thomas, called Red Hook, and is around 35 minutes by taxi. To travel to the British Virgin Islands from St Thomas, you can select from a number of companies, who will take you to either West End, Tortola or Road Town Tortola. Depending on your route the journey takes up to 1 hour. Please note that schedules are subject to change without notice. For the latest schedule as well as routes and departure times, passengers are advised to call the ferry company in advance of departure. Water Taxi’s direct transfer service from St Thomas airport. Please note that when departing the BVI by ferry, the BVI Port Authority encourages the public to arrive at the seaports at least one hour prior to the scheduled trip to allow enough time to pay for ferry tickets and departure tax, and be screened by security. In keeping with the regulations set out by the US Department of State, passports will be required for all US citizens. Horizon Yacht Charters advises guests to check the details on the US Department of State’s web site. There are many carriers that fly to these destinations including Air Canada, American Airlines, Continental, Delta, Jet Blue and Spirit Air. From either of these destinations you have several choices of carrier for your onward connection to Tortola, BVI as below. Here is a list of the current Canada flights for Canada to BVI (but always check with your carrier since schedules may change). Passports are required for all Canadian citizens. If you plan to travel to the British Virgin Islands from the UK, carriers include Virgin Atlantic, British Airways, BMI, First Choice and Norwegian who have direct flights from London Gatwick to Puerto Rico. The BVI is just a short 35-minute hop from Puerto Rico. Alternatively, you may wish to fly via Europe if your journey starts at a UK regional airport outside London, or via the USA. Direct flights to the BVI are not available, so you will need to fly to another Caribbean island from the UK and connect through to the BVI from there. Usually, this means you will typically fly to one of Antigua (ANU), Barbados (BGI), St Maarten (SXM) or Puerto Rico (SJU) and then catch a connecting flight. Here is a list of the current UK flights from UK to BVI (but always check with your carrier since schedules may change). Flight time from San Juan (SJU) to Tortola (EIS) is around 35 minutes. Scheduled carriers on this route are Seaborne Airlines, Cape Air, Intercaribbean, and LIAT. Seaborne and Cape Air both Code Share with American Airlines. You can read more about Seaborne Airlines Booking on AA here. Please note that in San Juan, Puerto Rico, the Cape Air counter where you will check in for your flight is Terminal A. The Cape Air gate for departing passengers is Gate D1. From St Maarten to Tortola, BVI: Winair, LIAT, and Seaborne Airlines offer connecting flights to the British Virgin Islands (EIS). From Antigua and Barbados to Tortola, BVI: LIAT offers connecting flights to the British Virgin Islands (EIS). VI Airlink and InterCaribbean Airways offer direct flights from Antigua to the BVI. Passports are required for all United Kingdom citizens. To travel to the British Virgin Islands from Europe we recommend you travel via St Maarten (SXM). There are many carriers that fly to St Maarten including Air France, Condor and KLM. From St Maarten you have several choices of the carrier for your onward connection to Tortola, BVI including Winair, LIAT and Seaborne Airlines. Passports are required for all EU citizens. For travel to the British Virgin Islands from Italy there are many options, including a daily service by major airlines to St Martin, San Juan, Antigua. Here is a list of the current Italy flights (in Italian) for Italy to BVI (but always check with your carrier since schedules may change). 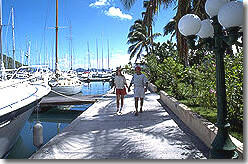 There are several options for travel to the British Virgin Islands within the Caribbean. From Antigua and Barbados to Tortola, BVI: LIAT offers connecting flights to the British Virgin Islands (EIS). VI Airlink has introduced a twice-a-week service, connecting Virgin Airlines and British Airways flights from Antigua to the BVI on Fridays and Saturdays. InterCaribbean Airways offer direct flights from Antigua to the BVI. Flight time from San Juan (SJU) to Tortola (EIS) is around 35 minutes. Scheduled carriers on this route are Seaborne Airlines, Cape Air, InterCaribbean Airways and LIAT. Seaborne and Cape Air both Code Share with American Airlines. You can read more about Seaborne Airlines Booking on AA here. Please note that in San Juan, Puerto Rico, the Cape Air counter where you will check in for your flight is Terminal A. The Cape Air gate for departing passengers is Gate D1. Here is a list of the current Caribbean flights to BVI (but always check with your carrier since schedules may change). Just send us your flight details and arrival times and we will arrange for one of our designated friendly taxi drivers to meet you at the airport. The taxi transfer is not included in your charter fee and the fare is $12 per person with a minimum charge of $36. The journey time between the Terrence B Lettsome International Airport at Beef Island to Nanny Cay Marina is approximately 40 minutes. If you are arriving by ferry from St Thomas into West End, please take a taxi from the taxi rank. The journey time from West End to the Horizon base is about 15 minutes and costs $10 per person, minimum charge $30. Water taxis are also available, including for example Captain Joey. Since canceling a holiday can be a costly affair – we strongly recommend that you take out trip cancellation insurance.